The Greater Haverhill Chamber of Commerce and Creative Haverhill have teamed up to celebrate the City of Haverhill’s 375th Anniversary with a rolling Trolley Tour of the city’s 5 Treasures on September 17th from 5-9pm. 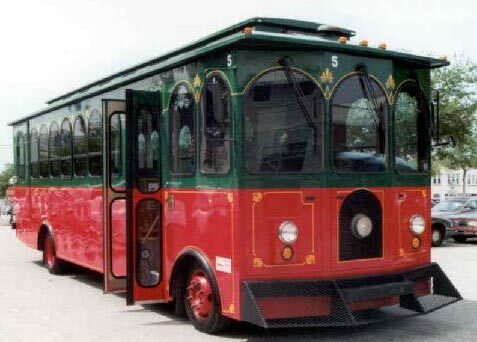 Old fashioned trolleys will greet passengers at Tattersall Farm, where they will embark on a tour that will include stops at the Firefighter’s Museum, Winnekenni Castle, John Greenleaf Whittier’s Birthplace and the Buttonwoods Museum before returning to Tattersall. Each stop will feature delicious food and beverages from local establishments, tours of the facility and/or grounds and historical perspectives. Reservations are required as space is limited. Tickets are $30 and may be purchased at the Greater Haverhill Chamber of Commerce, www.haverhillchamber.com . For information, call (978) 373-5663 or email info@haverhillchamber.com . Tattersall Farm: Haverhill’s own 150 acre farm, this property was owned and worked by the Tattersall family for most of the 20th Century. Bequeathed to the City of Haverhill upon Mary Alice Tattersall’s death in 1999, it remains a working farm under the direction of a Board of Trustees. Haverhill Firefighting Museum: Experience the evolution of New England Firefighting History at the Haverhill Firefighting Museum, home to one of the largest collections of New England Firefighting History in New England. Winnekenni Castle: This Castle, built by Dr. James R. Nichols in 1873, is a hidden jewel popular with residents of the local communities and tourists from all over the country. The original structure contained a gothic door opening up to a spacious Grecian Drawing Room, a Pompeian style dining room, Roman-tiled, black-walnut finished library, in addition to a kitchen, sleeping room, storeroom and laundry. John Greenleaf Whittier’s Birthplace: The Whittier Birthplace was home to Quaker poet and abolitionist John Greenleaf Whittier. This treasure remains substantially the same as when the poet lived there. Best known for his poetry—in particular his poem, Snow-Bound—Whittier was also a prime mover in the abolitionist movement. Buttonwoods Museum: The Buttonwoods site is in the middle of hundreds of years of Haverhill and Merrimack Valley history! A visit to the 1710 John Ward House begins a journey into life in the area during and after English settlement. The museum also houses furniture, ceramics, glassware, quilts, dolls and toys. A visit to the Duncan House illustrates the importance of the Merrimack River in trade, commerce and travel.